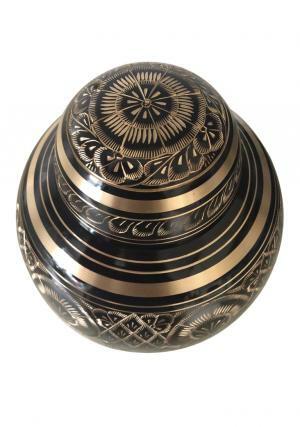 Beautiful, ornate and sophisticated, the Dome Top Radiance Adult Urn is hand cast from the highest quality brass and finished in black brass with polished engravings. The pattern is reminiscent of Ancient Roman funeral decorations, and features leaves and flowers in stylised bands of funeral adult urn. 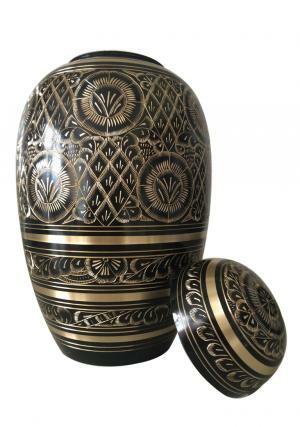 The combination of black and natural brass lends the urn for ashes has a sophisticated air that also has a natural place in a wide variety of memorial situations. 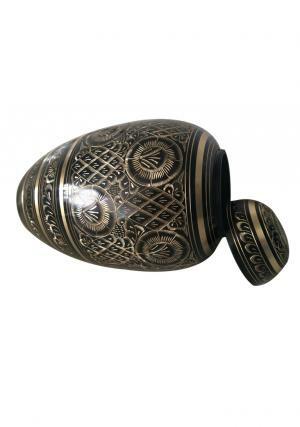 The Dome Top Radiance Urn is 10" inches height and measures 20" inches through its center diameter. 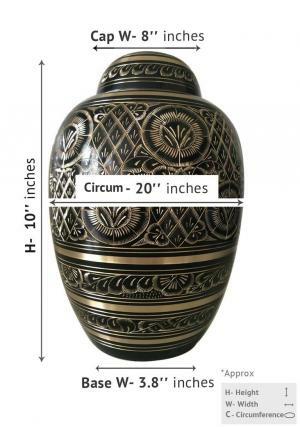 The urn weight roughly 1.8kg when unfilled, and is designed to take the full ashes of an adult. 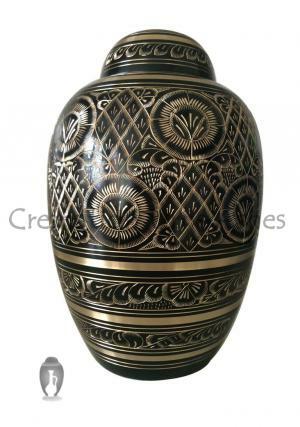 Brass urns have been used in funerary and memorial situations for thousands of years. From the Bronze Age onwards, metal was used in urn construction to create a long lasting item whose beauty matched its longevity. Often, cremation urns are associated historically with royalty. Egyptian burial urns is an example for example the body and spirit of the king or queen after their life. Our urns are delivered with well pakaged - so you can be confident they will reach with the same beautiful condition when they left our depot. In any unexpected cases if you experience any problem with your order, you can of course contact our customer services team for a quick, satisfactory resolution. We can be reached on 020 8004 6667. You can also contact us using cs@cremationurnsashes.com. Our customer services team is discreet and understanding, and will be happy to answer any questions you may have about your urn purchase.